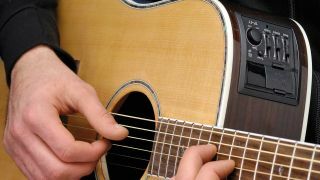 Getting a good acoustic guitar tone isn't as simple as just plugging in and turning up; it requires a careful understanding of how EQ frequencies interact and function in a band. Regardless of mic, you’ll probably want to lose everything below 50Hz, then sweep up from there to get rid of the rumble but keep the depth you desire. The busier the mix, the more excess bass will be an issue. Much above 100Hz and you’ll be losing too much if cut completely. If your mic is booming or ‘woofing’ a little bit around the soundhole, cutting frequencies between 100 and 300Hz can really help, giving the whole thing more poise and clarity. The ‘hi-fi’ sound starts taking shape in the mids between about 800Hz and 2kHz if you go for a big cut. High-quality, smaller-body guitars can have plenty of strength here for lovely vintage-style sounds, but cheap guitars can sound exactly that without a bit of care in this area. Very similar to the live application, 2-5kHz is where you’ll find sparkly treble for string articulation and liveliness. You can get a great lift in presence in the mix without having to increase the overall volume. If you find yourself radically EQing things just to get a workable sound, you probably need to rethink the recording process. A few dB here and there is all you should need if you’ve got a decent guitar, a reasonable mic and the positioning there or thereabouts! If you’re playing with a band, don’t be afraid to shelve off everything below 80Hz, maybe even 100Hz. These frequencies just clash with the bass and drums and make your band sound more muddy. This is what your high-pass filter is for. Using an under-saddle pickup? Spend a little time using a parametric mid to sweep around 800Hz-2kHz to find where it sounds most nasal and nasty. Start by boosting those frequencies as you sweep, then when you’ve found the frequencies where you like it least, give it a serious cut. If you have a dual-source system with a mic inside the guitar, pay careful attention around 100-300Hz. This it where it can sound muddy and thick. Cutting a little bit across these frequencies can really help with clarity. A little boost between 2-5kHz can aid with clarity in the mix, without you having to turn up too much. It’s a key vocal area too, of course. Don’t have a graphic EQ or a parametric? You just need to balance the bass, mid and treble as best you can. Many acoustic amps have a ‘shape’ or ‘tone’ switch that will sound relatively less or more mid-scooped. Start with the EQ controls in the middle, find the switch setting that you like best and tweak from there.